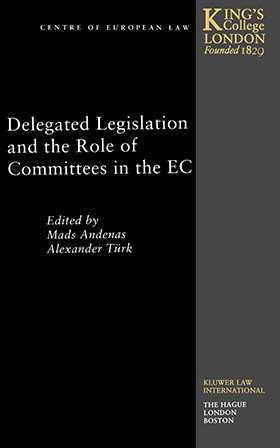 This book is the outcome of a research seminar with the title of `Delegation of Legislative Powers in the European Community: the Role of Committees' that was held in London on 16 and 17 January 1998. The seminar brought together academics from political and legal science in different countries of the European Community in order to provide as diverse as possible a set of perspectives on the topic. Some of the chapters of the book are based on papers delivered in the seminar. The first part of the book is primarily devoted to a political science perspective on comitology and provides a general theoretical framework. The second part is concerned with a normative analysis in a legal tradition of the issue of delegation of legislative powers. The aim here is to explore to what extent the national concepts and institutes of delegation of powers can contribute to a better understanding of the Community concept of delegation. The third part of the book concerns the institutional perspective and deals with the history of comitology and the role of the Court of Justice in the development of the system. The fourth and final part of the book examines various areas of EC law, including environmental law, product safety and other areas.